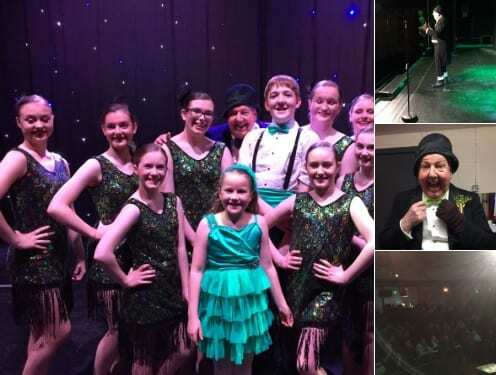 Northern Irish comedian Jimmy Cricket already knows where he will be on St Patrick’s Day next year. 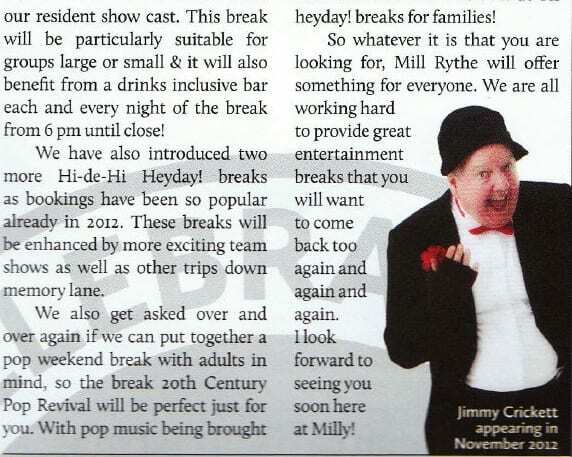 The famous funnyman appeared at the Mill Rythe Holiday Village on Hayling Island near Portsmouth in Hampshire recently – and was immediately invited back. 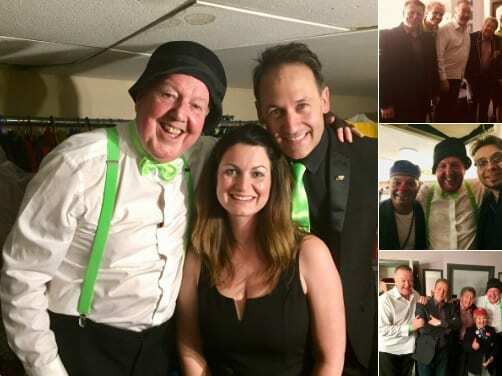 He will perform over the weekend marking the 2013 St Pat’s celebrations at the holiday village, having been asked to headline the main show on 17 March itself! 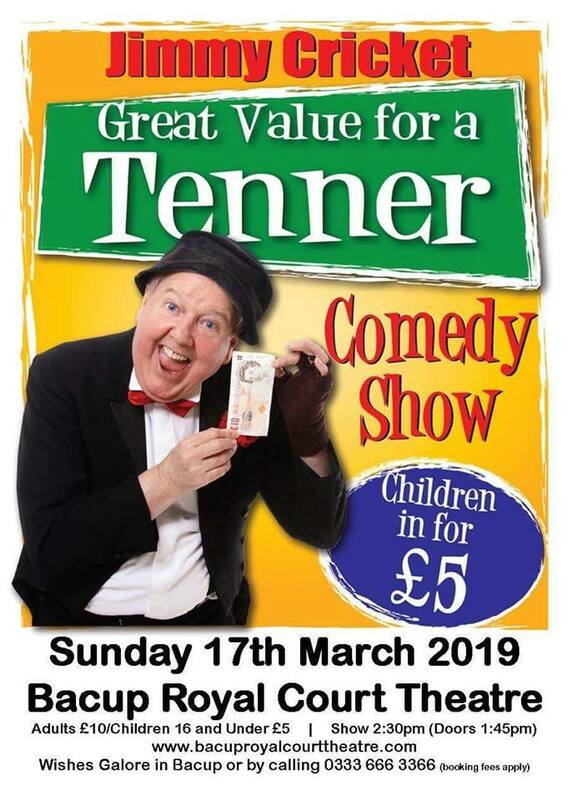 Jimmy had a great reception for his recent show and was full of praise for Jack – the centre’s entertainments manager who provided great assistance to the comedian during his visit. Mill Rythe used to be part of the Warner classic holiday villages network, but is now owned by the Away Resorts Company. They also own two other holiday centres – at Whitecliff Bay on the Isle of Wight and Tattershall Lakes in Lincolnshire. There are (only) 65 days to Christmas and here is a special offer to start the countdown to the great occasion. 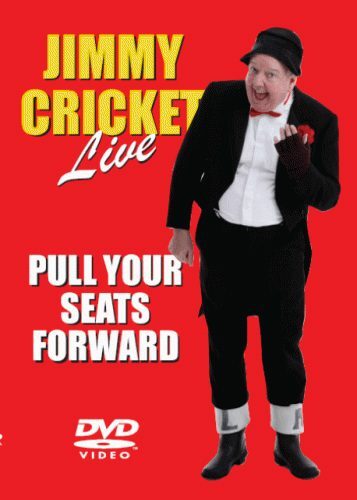 Buy Jimmy Cricket’s DVD Pull Your Seats Forward and you will also receive a free CD of your choice – all for £12 with postage and package included. The DVD was filmed by Jimmy’s small company, Wellie Boot Productions, a couple of years ago at the Royal Court Theatre in Bacup, Lancashire, near his adopted home of Rochdale in Greater Manchester. Belfast-born Jimmy produced it in response to the overwhelming public clamour that suggested there was a real demand for a recording of his stand-up. It is an hour and 10 minutes long and includes Jimmy’s favourite routines, a phone call and letter from his mammy, his famous Leaving Home poem, his sentimental ballad called I’m Dreaming of a Far off Land and 20 minutes of extras. The DVD is the best in family entertainment and a masterclass in comedy – more than 3,000 copies have already been sold. This “DVCD” Christmas bundle is great value for money and not available in usual retail outlets. The only way you can grab this fabulous deal is via this website – click onto Go Shopping page where you will find a purchasing option through Paypal. All orders are processed within 24 hours and we hope to ship out the product to be with you within one week. When ordering just opt for a DVD purchase in the usual way, but please state during the ordering process which CD you would like to receive free of charge as part of this Christmas bundle. You can choose from the following CDs: Best of Jimmy Cricket, Jimmy Cricket – I’m Dreaming Of A Far Off Land, Jimmy Cricket – A Bee in His Bonnet. This DVD will make an ideal Christmas present and if you want a special message signed personally by Jimmy and inserted into the sleeve of the DVD, please send in this request when you order and this will be done at no extra charge.